which really means...."crappy table by the kitchen doors"
(me and Jesus aka Kevin, apparently he's on TMZ all the time! He was so nice and genteel...and he said he loved me AND he liked my outfit...AND meeting me was on e of his favorite things!) 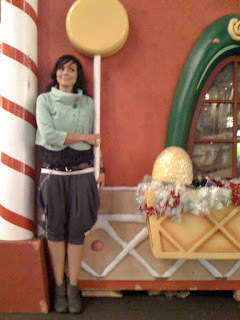 ...the Santa house with candy on it!!!!!! I got to see the water show...drink a hot peppermint chocolate from Coffee Bean, and a crazy lady tried to tell me she saw good things and asked if she could read my palm....I said no thanks and i didn't have any money...then she got kinda upset and didn's say anything else...go figure! 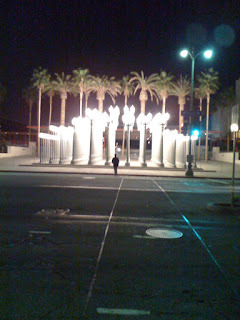 these are outside the LACMA (LA county museum of art.....)...ever since I first drove by this, I wanted to go back at night......the light is so beautiful and bright, when you're in the center of it...there aren't even any shadows...oh what a light!! i posted about this lacma installation last week - it's gorgeous - i loved it. ROTF, they said your pants looked like mc hammer's??? ughhhhh! I would have said something in spanish just to see what they'd say! 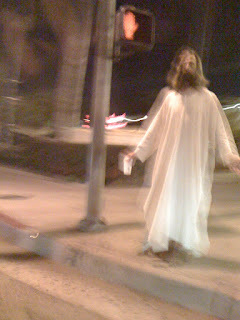 he really did look like Jesus! I wonder how many people he freaks out, LOL! I just learned about you through you tube and love you tutorials, i fell in love with Princess Jasmin how to and wanted to know if you can tell me where i can purchase the eyelashes..are they the same as the #316 you got from Naimies? This was so fun to see your day in LA and that MC Hammer comment was funny. You should have danced a little rap jig and said, "You can't touch this!" 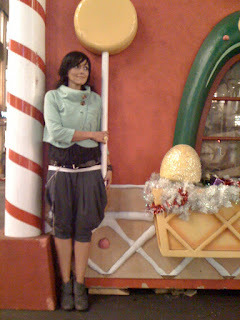 Kandee, your outfit is adorable! You're in Elle again. Page 264. Your this month's covergirl beauty guru! lol awesome post!!! LOVE your outfit :) I just started watching your videos - you're amazing! That sounds like an awesome day! Im soo glad you enjoy life and appreciate every aspect of it. Not many people do! I've been watching your videos since two months or so and I liked it from the beginning! I'm from Belgium, but I was born in Russia. But I'm going to make you famous here in Belgium too! I have something else to tell you too. Recently I started to produce music on my computer. I always had a piano and had 8 years piano lessons and jazz lessons. I saved your video also, when you talk about your dreams and to go and get them. Thank you so much for this. I have a very big dream and thanks to you, I'm not going to give up to reach my goals... So, Yesterday I was watching your video's from LA, when you walked in Lacma between those pillars, it was so dreamy and in the background my music played. It was a sort of starry night intro and it was so beautiful together with your video! Thank you Kandee for bringing the best out of me! When I feel bad, I always think not to let the bad thoughts in, like you said! "somedays feel like a little bit of sugary-wonder was sprinkled on them" I love that! hi kandeee!! it's a long time i don't leave a comment here but i read your blog every day! cuold you make a video on a makeup for blonde girls with fair skin and eyes? i'd love it! Hi Kandee quick question. 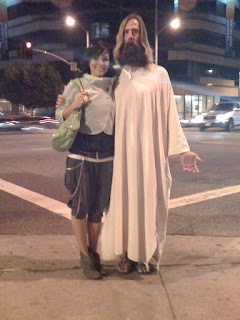 The guy in the Jesus getup was he on sunset blvd? I seen him today and thought of your blog, so i had to come and ask. I love your posts, and you videos, really like when people speaks from their hearts, specially if them energy is so vib like yours! Tha's gonna take wherever you want to be! I love your outfit in this post! Would you mind to tell where did you get it? SPECIALLY THE BOOTS!!! PLEASE! Really love them and I've been looking for sth. like yours! Thanks, and keep the good vib up, no matter what happens! That Jesus guy is hilarious! I took a photo with him and a really awkward Danish Marilyn impersonator. It was a moment when her dress blew up and I snapped a shot of him giving the view a raised eyebrow of interest. Funny! Thought I'd share.